WHAT DOES A SPARTAN VOLUNTEER DO? Spartan Volunteers are the backbone of every Spartan Race. 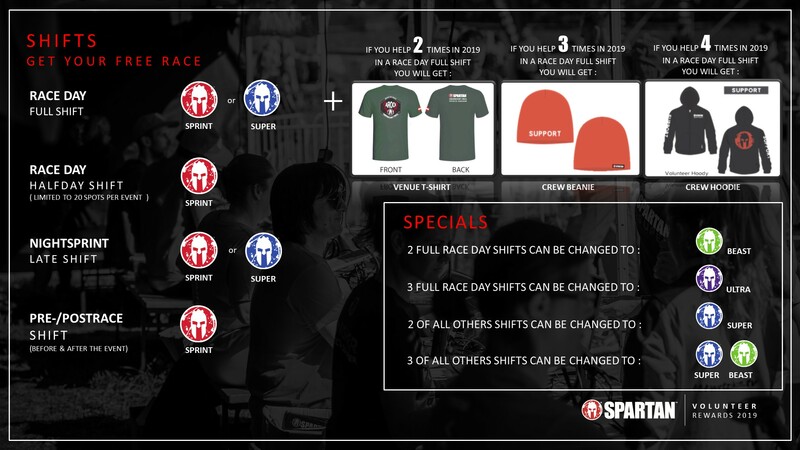 As a Spartan Race volunteer, you will ensure that our racers and spectators have an epic experience. Your efforts make the Spartan Race the best obstacle racing series, and ensure a great experience for thousands of participants. Spartan Race would not be what it is without you and your motivation! Spartan Volunteers work closely with Spartan Race staff. Days open to volunteering: Volunteering is possible from Wednesday or Thursday (depending of the event) till the day before the event to help the organization to finalize the details to offer the best race ever to the participants. Management of the Bag Check: Welcome of participants, reception and distribution of racers bag. Start and Finish Line operations: Final aid station, t-shirts distribution, management of the flow, organisation of the start and control. We are excited to announce a new volunteer program from 2019. Please read carefully the following information. A fun, action filled day helping to put on the best obstacle course race in the world! Volunteer on two days and grab your venue shirt. Support us three times and you will get your crew hat. Volunteer on four days and we will say thank you with our special hoodie – not available for purchase! STEP 1: Select the race you are interested in from the drop down, and fill out your information. Make sure to pay special attention when typing your email address, because this is how we will get in touch with you. You will receive information about 10 days before the event. STEP 2: Pay close attention to your email, especially as the race gets closer. Your Volunteer Coordinator will send you all final details via email. STEP 3: BURPEES. Make sure you know how to do a proper burpee HERE! STEP 4: Show up! If you sign up, we expect you to show up. We need you! If you have any question and didn’t find an answer in our FAQ, the Volunteer Coordinator can be reached at volontaires@spartanraceeurope.com. Just make sure to include the race location you are interested in when you email. One last thing, do not forget to join our Volunteer Facebook Group! Join the group to talk about your Spartan Volunteer experience or to ask your questions! 2019 Events are now open !